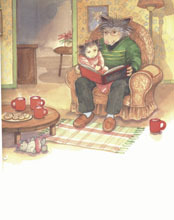 "Gilbert the possum is too busy daydreaming about what Santa will bring and participating in seasonal activities to think about his homework in this beginning reader (HarperCollins, 2008) by Diane DeGroat. After ice-skating, decorating the Christmas tree, and making cookies, Gilbert realizes that he has forgotten to do his homework. At school the next day Gilbert and his friend hastily build a snowman in an effort to creatively complete the assignment. He only gets half a smiley face, but is given the chance to finish his assignment successfully the next day. The crystal clear female narration is complemented by a male performing the character voices and minimal sound effects. Page-turn signals are optional. Children will be able to follow along easily in the book and peruse the watercolor artwork."